Created in 1963 by Marvel Comics maestro Stan Lee and artist Jack Kirby, The X-Men didn't really take off in the popularity stakes until after the first decade. The problem was the setting rather than the premise. The Original X-Men comprised anchor Cyclops (Scott Slim Summers, who emitted dangerous laser-like rays from his eyes), Iceman (Bobby Drake, who formed and manipulated ice), Angel (Warren Worthington the Third, who could fly with huge wings), Beast (Henry Hank McCoy, with the strength of a gorilla), and introduced Marvel Girl (Jean Grey, with telekinetic powers later to become Phoenix). 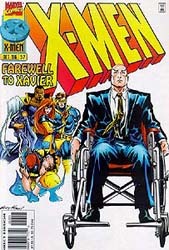 The wheelchair-bound telepath, Professor Charles Xavier, was their teacher-trainer, nurturing their mutant abilities. His dream was to have humans and mutants living peacefully together. It proved unsuccessful to the young readership to have teenagers put through such rigorous and dangerous training rituals. Xavier was regarded as a strict headmaster, and this wasn't fantasy escapism so much as an unpleasant close reality. When the situation was realised, the Original X-Men left to be replaced by adults. However, the Originals shortly returned as adults. In 1975 the X-Men received a much needed boost. Marvel writer Len Wein and artist Dave Cockrum revamped the format by having all of the Original team except Cyclops resign. The reasoning was to have several mutants come and go and therefore keep the ideas fresh. 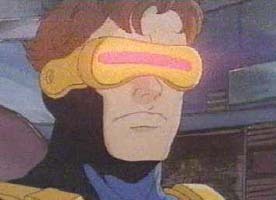 Some characters lasted the distance: mainstay Cyclops and Wolverine, for instance, whereas Thunderbird was killed in battle after only a third appearance. This made for interesting interpersonal upheaval as instability permeated the ranks. From this moment the popularity of the phenomenon became intense. One major comic release of the early nineties sold in excess of a staggering eight million copies. During the last few years, the X-Men has become Marvel's top title, even out-selling the hugely durable Spider-Man. Into this yawning chasm of demand for new material came X-Men the animated series. The concept proved difficult to achieve the necessary backing required to progress. However, once Margaret Loesch discovered the comics and the potential therein she was determined to see the characters come alive. Her employers at NBC TV simply weren't interested an X-Men cartoon. Later, at Hanna-Barbera, she proved highly successful at launching new material, but the various networks didn't see a market for the Marvel mutants. As Marvel president, Loesch produced a pilot episode which also failed to attract backing. Only when she joined the Fox Children's Network in 1990 did the project finally reach fruition. A phone call to Marvel's Stan Lee initiated the launch of an action-packed series which took the children's television market by storm (no pun intended!). It was a four-way collaboration between Fox (with national television rights), PolyGram - based in the U.K. (with international home video rights), Marvel Entertainment Group (with merchandising and worldwide publishing rights), and producers Saban International Services (controlling international TV rights). Animation by Graz Entertainment was conducted at Animation Houses: AKOM, Phillipine, and Hung Ying. As expected, Stan Lee was an Executive Producer, with Scott Thomas as Supervising Producer, and Dan Hennessey as Voice Director. After much deliberation it was decided to give the audience the later line-up. The nucleus of Cyclops, Beast (no longer human, but a blue-skinned animal-like creature), and Jean Grey remained. Added to these were Wolverine (also seen in his own comics run, and considerably toned down from the aggressive killer in the name of justice), Storm (with the unexplainable ability to manipulate the weather), Rogue (who can absorb the powers of others things through touch), Gambit (with kinetic energy abilities), Morph (specially created for the show - but soon sacrificed to display the magnitude of the youngsters' struggle - and able to change his appearance to resemble anybody), and the obligatory newcomer Jubilee (who can shoot plasma from her fingertips). The X-Men is set against a believable future society backdrop wherein humans with mutant abilities are born naturally at irregular intervals. It is law for parents to register these births at the Mutant Control Agency, leading to their collection by robotic Sentinels. In the first two-part story, Night of the Sentinels, a mighty battle ensues when the team prevent Jubilee from being taken. She is then drilled on mutants and their history, before finally becoming a member of the élite. The X-Men scores high by making a very valid but prudent point regarding racism. The ultimate objective is for homo sapiens and homo superiors to live peacefully together. They seek to stop the persecution by destroying the Sentinels and bringing to justice those behind them. Ironically, evil mutants are often utilised against the X-Men. 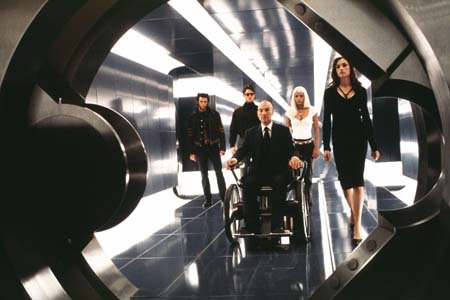 An aspect carried forward from the earlier format is the presence of Professor Xavier as their mentor, although there are many stories in which he doesn't appear at all. Many earlier characters make starring appearances throughout the episodes; among these are: Archangel (originally simply the Angel), Colossus, and Domino. The main villains of the piece are Magneto (with the power of magnetism), Juggernaut (a massive, almost unstoppable powerhouse, and the half-brother of Prof. X), Mojo (a devious TV executive from a parallel dimension), and Sabretooth (supposedly a reverse Wolverine, but not too dissimilar). The X-Men of this series bare comparison in certain aspects with two other Marvel creations. Peter Parker of Spider-Man is an insecure young person who suffers the anguish of everyday events, even though he possesses special powers. The Fantastic Four's members bicker almost constantly, particularly the Human Torch and the Thing, but in reality they are the closest of companions and know instinctively they can rely on each other in dire situations. This is the driving force behind the programme, and the main compulsive element; the inter-character relationship is everything. The animation uses the latest elements of the standard age-old format, although the considerable attention to detail, and the almost constant action, makes it appear more sophisticated for a programme targeted primarily at a young audience. Many of the classic stories are given the only justice possible in half an hour. The Dark Phoenix Saga, Days of Future Past, Birth and Rebirth, and Beyond Good and Evil. Fortunately, some of these major events are catalogued over several parts, allowing for the appropriate cliffhangers whilst neatly tying-up each sub-plot. The X-Men's début in America was on 9th January 1993, four months after its original scheduled start in September 1992, although an isolated episode was tested for the market during October 1992. In the perpetually tough competition of the Saturday morning children's spot it went from strength to strength. In a matter of weeks it took the highest viewing figures for not only the youngsters age group, but also the teenagers, who only normally boosted the live-action shows. Saban attributed the roaring sweep to the gritty, action-orientated and character driven direction of the show. Fox also reasoned that the establishment of the fast-growing Fox Kids' Club, which at that time boasted 7.5 million members, was obviously a factor, spreading awareness and accelerating promotion. Advertising is an enormous source of income for any network hitting the top spot, and the Fox Children's Network is estimated to have been worth up to $27,000 for only a thirty second promotion during the X-Men. Contracts were sometimes arranged and finalised for these brief gaps a year before airing. An initial season of thirteen thirty-minute episodes was produced at a reported cost of $400,000 each. When these proved successful beyond all expectation, the trend was continued. To date, around sixty, spanning four seasons have aired in the US on Fox. The X-Men was seen over here on Sky One weekdays at 4:40pm during the mid-nineties and sporadically on terrestrial TV. On a final note: One of many projects Marvel Entertainment is adapting for live-action features is The X-Men 2, again with Patrick Stewart as Prof. Xavier. The first X-Men film proved highly successful and paved the way for a veritable goldmine of Marvel material: Blade, Spider-Man, Daredevil and The Hulk, with The Fantastic Four, The Punisher and The Silver Surfer still in their early stages.